Signal Gallery opens after the summer break with a very special group show, which introduces some exciting new names to the gallery, as well as continuing to support our existing artists. 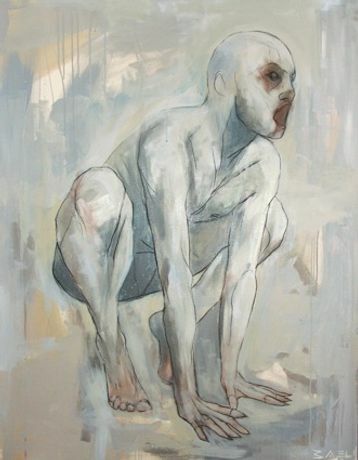 The show is called âConfigured' and will feature strong figurative work of very different styles. As normal with our group shows we aim to curate work that is both interesting in combination and strong as individual work. New artists to the gallery are Sandro Kopp, John Clark, Ian Hodgson and Massimo Paganini. Sandro is well known internationally for his portraits and confident figurative style, in particular his stunning portraits of his partner Tilda Swinton. John Clark was recently one of the winners in BBC2's âShow Me The Monet' show and had his work shown and auctioned at the Royal College of Art (where we met him during filming). His fluent and dynamic style was developed within the computer games industry, which he satirises in his paintings. Iain Hodgson has had a ten-year career showing mainly in Brighton and across the UK. His ghostly imagery often combines figures in mysterious architectural landscapes. Massimo Paganini lives and works in Bologna in Italy and this will be the first time he has shown in London. His varied and fascinating paintings for the show, will feature works based on his own videos. All our existing artists will be providing new work for the show. Following his successful solo show earlier this year, Bael will again present us with three more of his beautiful, angular figures. David Le Fleming, will be surprising us with new work, some of it in a powerful new style. Iain Andrews's success last year as the winner of the prestigious Marmite Art Prize has led to offers of exhibitions all over the world and his work being bought now by some major collectors. Crawfurd Adamson's CV is too extensive to mention. He has being showing internationally for nearly thirty years and has been described as one of the leading figurative Scottish painters of his generation, alongside Peter Howson and Ken Currie. John Simpson, also living and working in Brighton, has made by excelling in the complex medium of monotypes. His strange and unnerving anthropomorphic imagery has been seen in his hometown, as well in London and internationally. With the inclusion of the elegant and characterful sculptures of Sean Madden this completes our trio of Brighton based artists.